My relationship to this project (and family) goes way back. Like twenty years back. Yikes! Were my college days really that long ago? I knew the husband at Purdue (Go Boilers! ), met the wife here in Minneapolis, and kept in contact over the years. Fast forward to that time when our home was featured in Midwest Living Magazine. :) The wife saw the article, called for help with their newly purchased home, and the rest is history as they say. I consider her my first 'real' client and the relationship continues as we chip away at every room of their house. One of my favorite aspects of the project is their unique style. 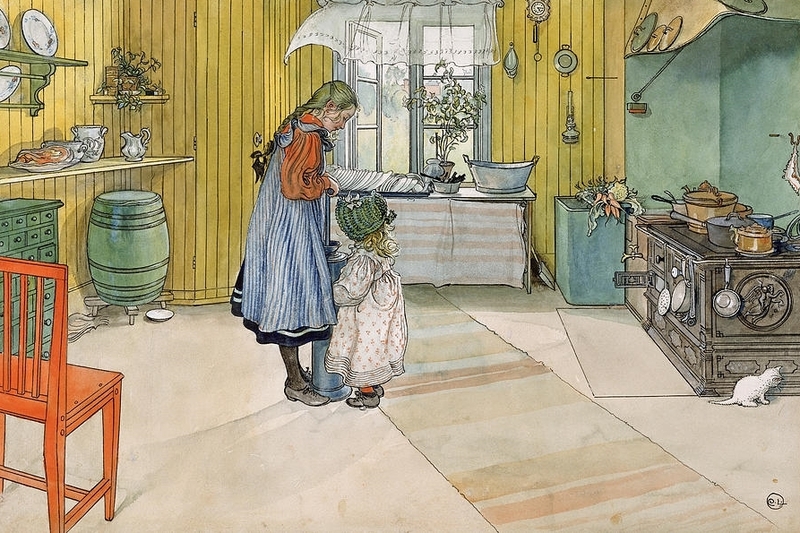 I'd call it Mid Century Modern meets Carl Larsson. Do you know Larsson's work? It is stunning and every aspect of their home will draw from it's saturated color, free form styling, and rich history. Then to mix things up, we will add touches of Mid Century Modern to tie in with the age and bones of their home. It gets me excited. So, the first project I want to share is their master bedroom. When I saw it things were looking...well not very Larsson-ish. The desire was to make the room more inviting, soothing, and generally pulled together. One thing that I love about this client is her appreciation for antiques. We knew the antique dresser was staying and early on she mentioned she had access to a brass headboard that once belonged to her grandparents. Um, yes. My client also wanted to keep the throw blanket, so it was a natural jumping point for the rest of the decor. Our first step (besides removing wallpaper - ha!) was to add a rug to brighten up the space, and since we weren't adding much color to this room, it provided a way to add texture and pattern. The next step was to get those windows looking finished. Curtains to the ceiling and natural woven blinds to fill the gap between ceiling and window added some texture and made the room instantly feel taller. Then over time we added a second antique dresser, night stands, artwork, knick knacks and a fun collection of family photos next to the bed. One 'rule' I have established for this home is that the lighting throughout will lean Mid Century Modern. So in this room we added some architectural sconces and an appropriate lamp on the new dresser. After those pieces fell into place, you better believe I took photos.